Sets used by the Carleton Ravens in their 2015 CIS final win against the Ottawa Gee-Gees. The match-ups are 1 (Phil Scrubb) and 4 (Tommy Scrubb). 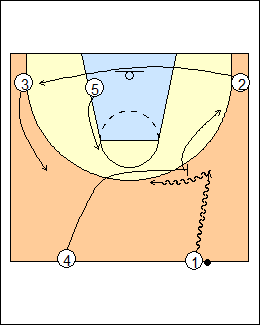 Carleton used this play about 20 times in the final, mostly on this side of the floor, a few times on the other side. 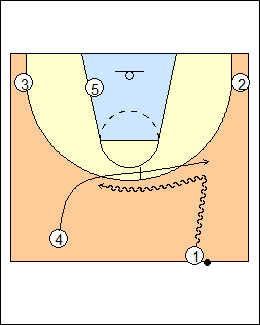 1 dribbles to a wide slot, 5 sprints up to pick and roll, facing the sideline, 4 spaces weakside, 2 fills behind. - 1 passes to 3 who drives. See Tactics - Van Gundy ballscreens (Shake), Lawrence Frank ballscreens (Strong). 1 dribbles to a wide slot (or lower), ballside 2 clears, 4 ballscreens, 5 lifts to the weakside elbow (taking away help on a pick and roll), 4 rolls or pops. See Quick hitters - Ravens, Offence - Carleton Ravens. Corner filled, 4 sets a screen near the top of the circle then pops looking for a pass. 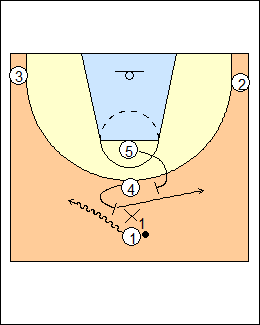 See Offence - Tennessee playbook (late clock #3). Screen-the-screener, 2 screens for 4 then 5 screens for 2. See Offence - Houston Comets (option d), Quick hitter - America's play. 4 can reject 2's screen and use 5's downscreen. 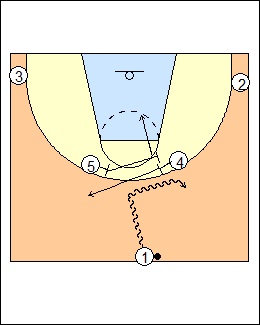 Horns set, 5 and 4 ballscreen for 1, 1 uses 4, 2 gets open for a pass, 3 backscreens for 4. 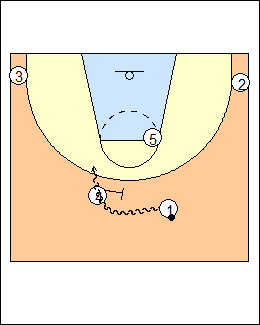 See Offence - European (option 11), Horns 1 Brazil. 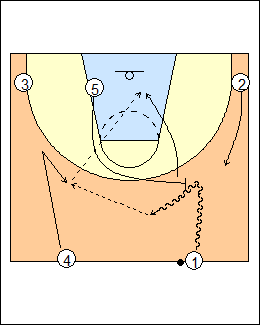 Another Horns screen-the-screener, 1 uses 4 then 5 screens for 4. See Quick hitters - High and wing, Horns - 1 wildcats, 1 Beltramo (Fox). 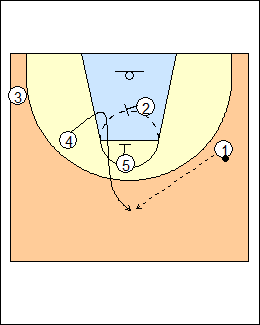 Variation - 4 turns and re-screens for 1. 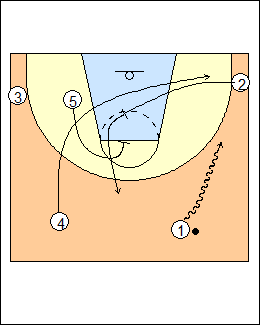 See Horns - 1 Beltramo (Invert to re-screen), also Tactics - Fratello double high posts. 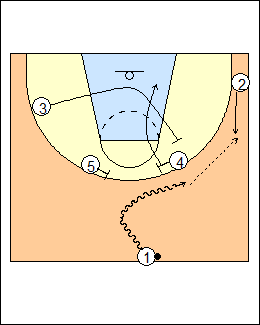 Another variation - 4 and 5 start in a tandem, 4 picks a screen angle for 1 then 5 screens for 4.